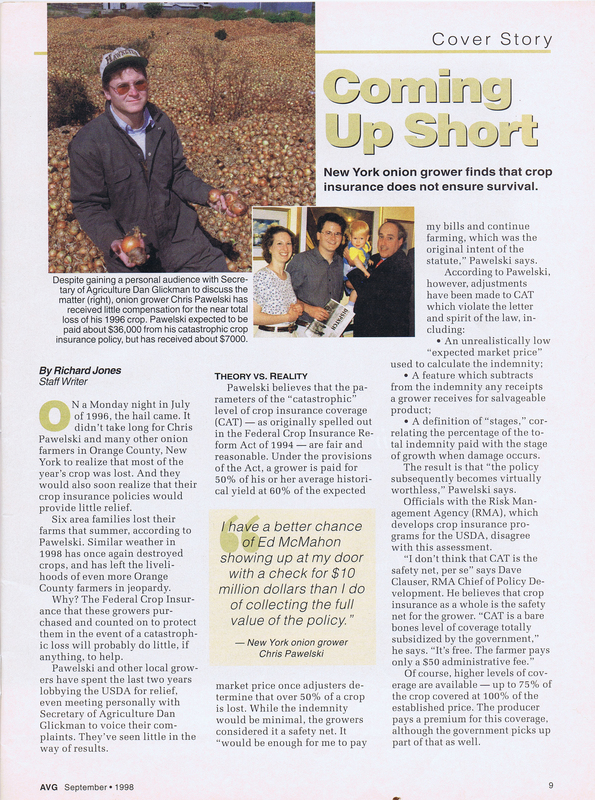 The following is another brief excerpt from my yet unpublished memoir, “Muckville: Farm Policy, Media and the Strange Oddities of Semi-Rural Life.” This small section of my memoir deals with the backstory behind the American Vegetable Grower cover story I was featured in back in 1998. That piece and the subsequent follow-up pieces and editorials by American Vegetable Grower Magazine, along with the initial two CNN pieces produced by Frances Causey (see: https://muckville.com/2013/11/18/the-backstory-on-our-first-two-cnn-appearances/) were a major factor in our ability to accomplish our goals of fixing the federal crop insurance program and eventually securing significant disaster aid. Before the excerpt … you knew this was coming … as I have mentioned multiple times previously my campaign to raise funds for an editor will be featured in an upcoming episode of the new Crowd Funder Show. You can’t always get a-what you want. But if you try sometime, you just might find, you just might find, you get what you need. On the drive home from Washington, D.C. Eve and I talked about what we had just done, and recognized we had two, distinct problems or issues or situations we had to now work on. The first was we needed disaster aid. Our valley now had been hammered 2 out of 4 seasons and we needed special help in which to survive, as a farming region growing onions (eventually our area would be hit by additional significant weather disasters, including a devastating drought in 1999 and an excessively wet year in particular in 2000 Those disasters lead to massive crop losses throughout the Black Dirt area of Orange County). You can’t sustain these sorts of losses and continue to operate. It’s that simple. Second, we needed this crop insurance policy fixed. It was not working and virtually worthless and if this was all we would get for the time being, then we needed to get it fixed. So, at this point Eve and I began working on a comprehensive strategy … a battle plan on how to get this done. Now, we knew these issues and the key players and strategies overlapped and went together, hand in hand. Sometimes things would be done according to a plan, sometimes by the seats of our pants, but we committed ourselves to work on it. Unpaid mind you. Nobody paid us for what we did, it was pure, grassroots volunteerism. Fortunately agriculture, as I mentioned, is for the most part very bi- partisan. Now we started to really develop our political contacts and our media contacts to get our goals accomplished. It’s been an ongoing process, some things we have been working on for over 16 years, but, we have had a number of pretty significant accomplishments and achievements. Allow me to share with some of the highlights, “best of vignettes” and details of what happened from 1998 forward. Literally minutes after we walked in the door back from our meeting with Secretary Glickman the phone rang. It was Richard Jones, a reporter for the trade publication American Vegetable Grower Magazine (AVG). Now, let me just pause and say that Richard, his editor at the time Rick Melnick, and his publication did more for our causes and situation than I can possibly relate, or express my appreciation for. And it wasn’t just them, I can’t say enough good things about the various press outlets I have dealt with over the years, ranging from the very small local newspapers, The Warwick Dispatch, The Goshen Chronicle, and Warwick Advertiser, to the largest local paper the Times Herald-Record, to various reporters at local radio stations WALL and WTBQ (including talk show host Chris Cordani), to numerous trade publications as well as other local, regional and national newspaper, magazine and radio and TV outlets, including and especially Hank Gross of Mid-Hudson News. I have either been quoted or interviewed and have appeared in (or written letters to the editor or op-eds for) hundreds upon hundreds of media pieces over the years. From CBS News network, to WABC Channel 7 in NYC, to CNN, to the New York Times, Crain’s, to Bloomberg News, to various public radio programs to, the BBC and The Hindu, to Vogue Magazine, amongst many others. And for the most part my experience has been that the overwhelming majority of reporters that I have dealt with have been very accurate, very fair, and have written very solid pieces. And if it weren’t for these reporters, and editorial boards, and news outlets, etc …, we would not have been able to accomplish a fraction of what we were eventually able to do. They told our story, conveyed the outrage, and alerted the public as to what we were facing. These people, most especially on the local level, are unsung and underappreciated heroes. How would the school teacher, or the bricklayer, or the office worker, ever know what we farmers do and what challenges we have faced if not for the stories told by these journalists? Well, back to 1998 … I answer the phone and the caller tells me his name is Richard Jones and he’s a reporter with American Vegetable Grower and he wants to do a story on crop insurance. I laugh and tell him where we just literally walked in the door from. Evidently he had heard about our lawsuit and saw some of the local media pieces about our current disaster. I obviously gave him an earful and told him I would be e- mailing him a ton more information. I then told him about Glickman’s solemn promise that “no USDA official will ever say ‘CAT is free or cheap’ or that the local onion farmers in the Black Dirt were at fault for their current dilemma because they didn’t purchase the (worthless) buy-up coverage.” I said to him, “I guarantee you that someone of importance you interview will say that to you.” Richard laughed. He details the problems with the policies in the letter. This was just days after Glickman admitted to Eve and me the buy-up policies were virtually worthless and said to us even he wouldn’t buy them himself. After Glickman promised Eve and me that no USDA official would ever again say something to the effect that CAT is free nor blame us for being at fault for not buying the worthless buy-up coverage, Ackerman, the head of the Federal Crop Insurance Program does exactly that. This is what Glickman promised no one would do, to a Congressman no less. What a complete, total jerk. And this told us that Glickman’s word was worthless. The article, in well written layman’s terms, explained how crooked the policies were, how out of touch USDA was, and how screwed we were. It was akin to the dropping of an atom bomb. It, along with the subsequent press coverage that followed, combined with our failed lawsuit, now properly motivated the USDA to change course. And that was true. But it took time. And it took more hammering in and from the press. And it took the relentless work of Representative. Ben Gilman and his staff. If you type the phrase “Congressperson” on Google a picture of former Representative Ben Gilman should appear. Ben (who was eventually re-districted out of his seat after the 2000 census) was the quintessential Congressperson. Serving the needs of his constituents always came first with Ben and partisanship or politics always took a back seat for him when it came to working on behalf of his district. And Ben always recognized that farming was a key part of his district. Ben was always a friend of the farmer. Ben also hired quality staff, from his district representatives, to his ag staffers, to his legislative director and chief of staff. Ben and his staff worked tirelessly in our behalf. Ben too worked on two issues, 1. Getting us adequate disaster aid and 2. 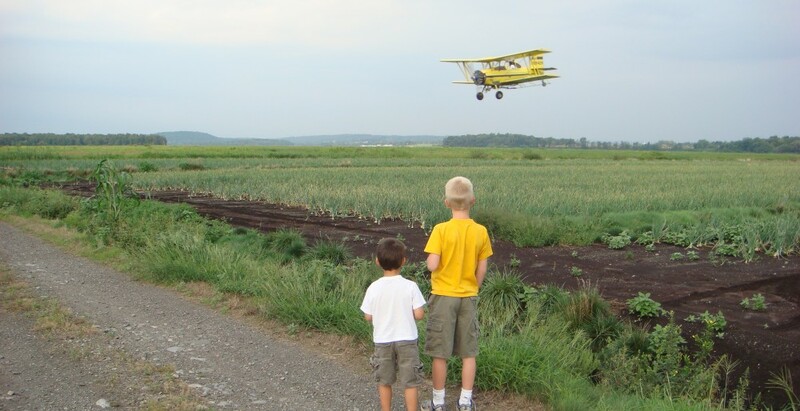 Getting the USDA to do its job and fix the MPCI policy for onions. And Ben used all of his clout and relationships to do it. This included his friendship with Secretary Glickman. Ben and Glickman served many years together in the House and served during a time when Republicans (like Ben) and Democrats (like Glickman) could work together, and even be friends. Our getting a meeting with the Secretary of Agriculture in the U.S. Capitol building is not something that happens to everyone, nor every day. But meetings weren’t enough for Ben. He pestered and haunted Glickman. And his colleagues on the Hill. After the American Vegetable Grower coverage Ben twisted Glickman’s arm to form a “Onion Price Committee.” Made up of USDA officials in Washington, RMA officials, USDA-NASS staff as well as our local Cornell Cooperative Extension educator Maire Ullrich, and staff from Gilman’s office, it was chaired by Eve. The Onion Price Committee met over a few months in 1999 and changed the procedure as to how the onion expected price was set in the policy. After this committee’s work the price went from an absurdly low figure of $4.85 in 1996 to realistic settings after 2000. Next was something had to be done about “Stages” for it totally eviscerated the value of the policy. But an extra push was needed for this. That push came in the form of additional press coverage. But this time the press coverage wasn’t from a trade publication, this time it would come in the form of primetime cable network news, via CNN. In 1999 much of the eastern seaboard was devastated by a drought. Virtually all forms of agriculture were severely impacted, including the onion growing region of Orange County. 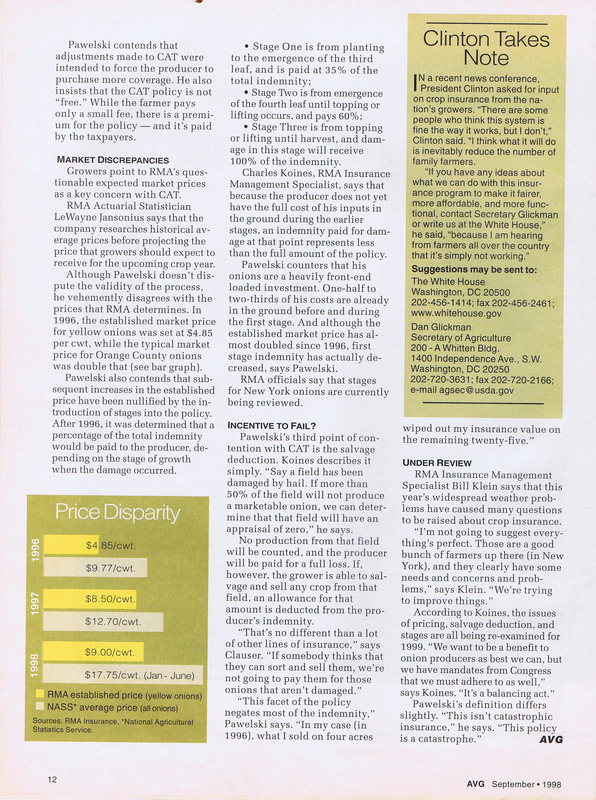 American Vegetable Grower continued to pound the USDA on the crop insurance issue. 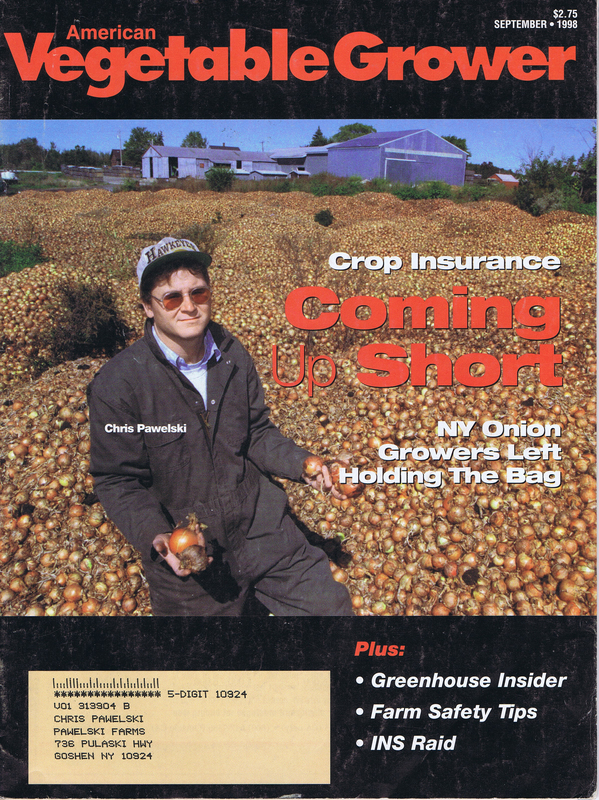 In the April 1999 issue reporter Richard Jones did another story on the problems with the federal crop insurance program, this time focusing on an Idaho potato grower named Bruce Watson. Watson was an internet friend of mine and I put him and Richard together. 10. There’s no free cap or jacket. 7. Crop failures build character. 1. Life would be dull without daily doses of fear. To people who had lost their crops, had been put deeply into debt (if they were lucky enough to stay in business) and in some cases been put into even more debt because of boneheaded RMA decisions, well, this sort of list was offensive and deeply disturbing. And Richard and AVG thankfully agreed and exposed it. A month later, in May of 1999, Secretary Glickman was traveling through New York and Representative Gilman was able to persuade him to meet with Eve and me and a few other growers in an office at Stewart International Airport in Newburgh, New York. Along with Glickman was his newly appointed (as of April 14th) Deputy Undersecretary for Farm and Agricultural Services, Tom Grau. We discussed the problems with the crop insurance program, how there was little improvements made (apart from Eve’s pending work with her Onion Price Committee, which did eventually bear good fruit) and how angry we were over USDA officials breaking his promises to us. 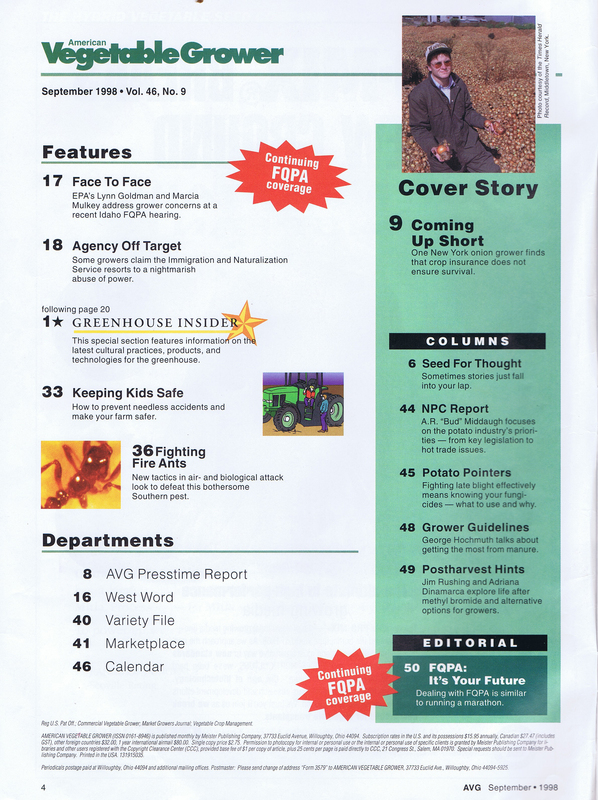 But what stood out in the meeting was what I said to Glickman regarding that “Top Ten List.” I told him his agency was totally out of touch and I then pulled out the American Vegetable Grower article with the “Is Anyone Laughing?” sidebar, put it under his nose, and asked him to read it. Glickman said, “This isn’t funny.” I responded, “No it isn’t Mr. Secretary.” Glickman the repeated “This isn’t funny” but added, “maybe the context explains it.” I said, “Mr. Secretary, what context could explain this? Give me a break, it’s offensive, period.” Glickman was clearly caught off guard and stunned. He promised us that something would be done about it. Per his modus operandi, he said the right thing, but did nothing. But, that’s not to say nothing was done about it. A few months later Eve and I gave a copy of that article to our dear friend Pat O’Dwyer, who was First Lady Hillary Clinton’s point person in Orange County for her U.S. Senate election campaign. Pat then gave it to Hillary at a fundraiser in New York City. About a week later, in early November, Pat got a letter from Ken Ackerman informing her that the offensive list was taken off RMA’s web site and would be deleted from future print editions of the RMA publication. This was chronicled in the December, 1999 edition of American Vegetable Grower. That piece reported that Ackerman admitted “the list was inappropriate.” What’s pathetic is that for months after Glickman made the same admission and said something would be done about it, nothing was done. It was exposed in a major trade publication, yet nothing was done until the First Lady/New York Senatorial candidate Hillary Clinton intervened. The one good thing that did come out of that meeting was that the New Deputy Undersecretary Tom Grau was charged by Glickman to work on our onion policy problems. Specifically, to do something about “Stages.” What Eve and I pushed for, and Representative . Gilman became a vociferous advocate for was what is termed a “pilot program.” This is a policy or modification to a policy that is supposed to exist for a given period of time and designed to essentially be an experiment. What we wanted, and Gilman conveyed this to Glickman and Grau, was a pilot program of a “no stages” option for our policy, where if the grower bought the buy- up policy they could elect to purchase this pilot that would have no stages. It would obviously be more expensive than the regular “Stages” policy. It was ludicrous that we had to fight for something that a couple of years previously was the norm and to remove something that doesn’t exist for most other crop policies, including and especially for the large grain or commodity crops. What is apparent is that growers of large grain and commodity crops had the political muscle to ensure that it wouldn’t be implemented in their policies. From that point on, in most of my subsequent posts and writings I would quote that line and often state “someone that heads the government’s crop insurance agency lacking ‘farm, management and insurance experience’ is akin to the head of NASA lacking flight, engineering and science experience.” I would then ask, “how on earth did this man get this job?” I also gave him the nickname “Ken ‘no experience’ Ackerman.” I was later told that a number of USDA employees, who mainly worked for USDA and were no fans of Ackerman, adopted my nickname for him and started using it themselves.